“Social Climber” is the name of our climbing rose bush. I love that name! 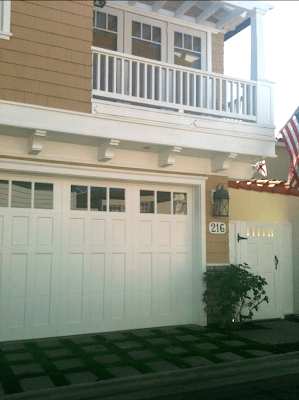 We planted it right after we finished the remodel of our beach cottage in Newport Beach, California. 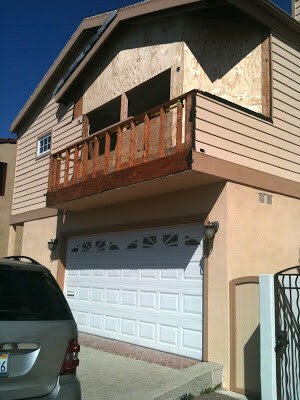 a new railing, windows, smooth plaster and a new wooden garage door. MORE blooms on it now. 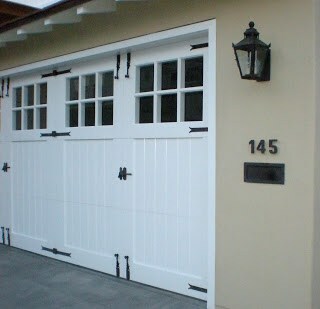 Vignette Design’s great post on carriage style garage doors. (and we were at the end of the remodel budget). Here are two other garage doors that I admire on Lido. I may switch out the garage door for a more stylish “carriage cottage”one. Aren’t these great succulent arrangements from Roger’s Gardens? (she is kind of the princess in our family). Mary Anne I love everything you have done!! Excited to see more! The social climber is gorgeous! It's going to be spectacular once it grows the two stories. You are a genius to add the placemat to the tray. I'm obsessed with that tray. Is it, by any chance, a recent purchase? Yes…just bought it at Target last week. 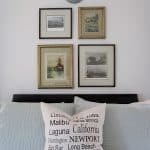 Love all the pretty "Mary Ann" touches throughout your beautiful home. Funny I bought that same tray while at Target in red (only color they had) as part of a birthday gift for a friend (reds her favorite color and she has a lot in her kitchen) Its a great tray and what you did was so creative! that looks like a 'milling road' dresser by baker. 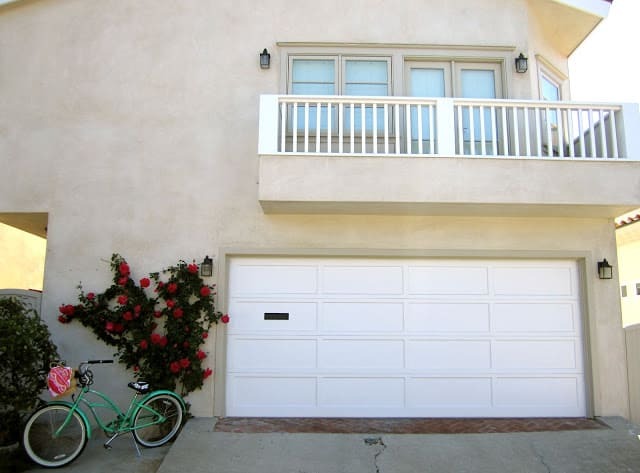 the other garage doors are divine! Your "social climber" will be the star of your neighborhood….just give her a little more time. Beautiful! I love what y'all have soon with the cottage. It is just beautiful. I am swooning over the rose bush. Such a beautiful color. Love that rose, I can't wait until it reaches your second floor. Four years ago when I did some work to my old craftsmen house, I wanted a carriage style garage door, but the opening was an odd size, and I was out of money. My contractor was able to fake up the wooden door (similar to yours) with forged iron faux strap hinges and handles for about $100 that he found at a hardware store that specializes in new hardware for old houses in Pasadena. It really looks like a carriage door style garage door. Great idea…I'll have to think of something. Hi! The rose is beautiful but I have to say I love the transformation of your house. It is fabulous! Not that it didn't look good before. I really love it. I love the climbing rose and the stucco on the back. What a pretty back of your house! I love the plants too. What a transformation. Love all the things you did to the outside of your home and the climbing rose is gorgeous!! 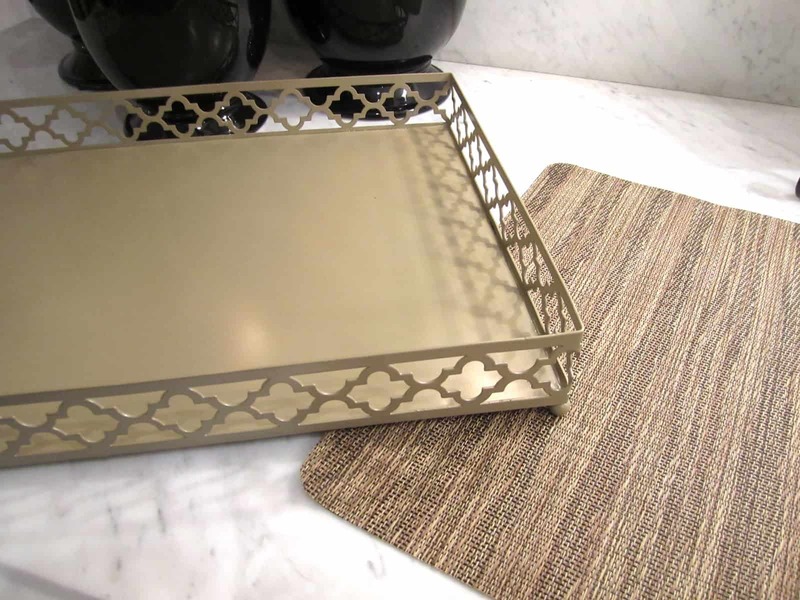 How crafty are you – love the placemat in your cute tray!! What a beautiful climbing rose. Love the house redo. What a cute bike. Your home is so beautiful, Mary Ann, even your garage area!! Love the "social climber"! So pretty on that wall. Beautiful!!! 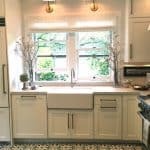 Your kitchen is uh-mazing!!! You live in my favorite place ever 😉 heading there now to be with my sis!!! Yeah! Beautiful plants!! Love what you did with that Target tray. Love everything you have done! You certainly have an eye! The rose climber is beautiful. I love all the changes you made to the exterior, especially the plaster and railings. I did a similar thing to my garage door that anonymous describes. The door was clad with a rough sawn Texture 111 siding. Then I found old French bronze door handles on ebay and antique strap hinges from a dealer friend. All that is required is heavy duty springs for the additional weight. I like the way you dealt with the cable equipment on your dresser. 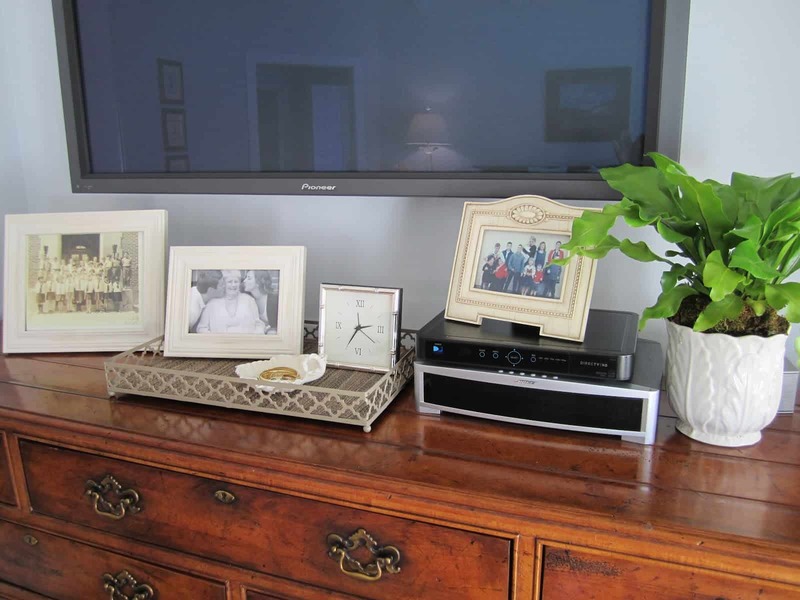 It minimizes the importance of the cable boxes and brings attention to the pretty things. (I am sure most of the men out there are wondering why these boxes bother us.) I just installed a TV on the wall and had all the equipment installed in an adjacent closet. 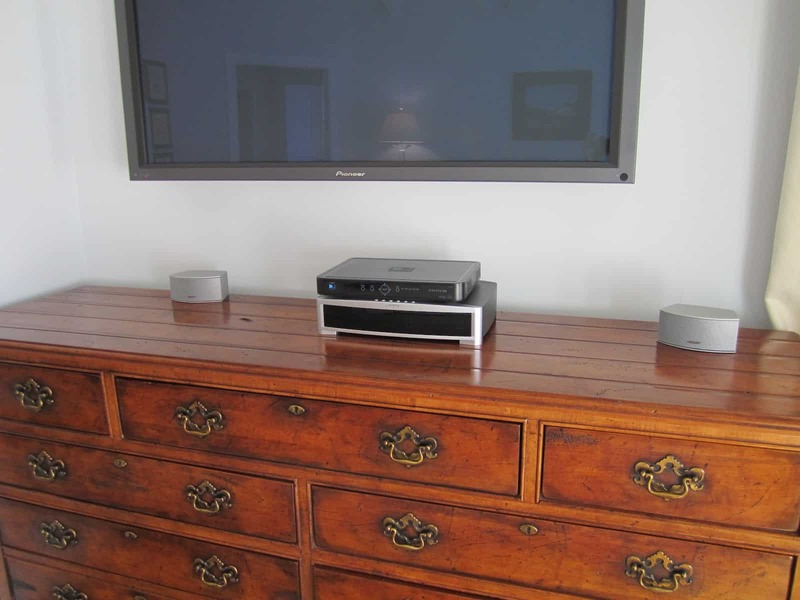 It operates the TV wirelessly, but I don't know if it only works with certain TVs. The succulents are beautiful, as is your kitchen. I love the "carriage house-garden gate" type of garage door too. I will have to wait until our well-made, raised paneled garage door breaks before I can justify a new door, but a girl can dream and plan, right? 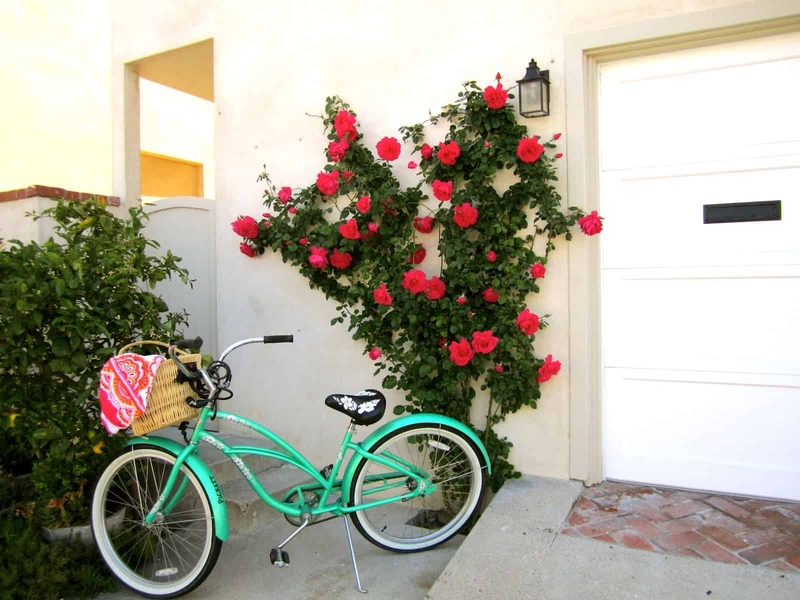 I really like what you did with your home and the rose is so pretty on the stucco. Trays are a favorite accessory for me and they seem to create a nice vignette for almost any surface. Way to go, the t.v. electronics are hardly noticeable now. Love all the changes and the little details you have added. Your home is beautiful. I was at Target yesterday and saw those cute tee towels you posted. My new favorite thing is succulents. Nice before/after photos and love the climber! That will look so pretty as it grows. I love the succulents in your kitchen. I've been picking them up at the nursery for indoor pots. They are so easy to care for! Hi There! 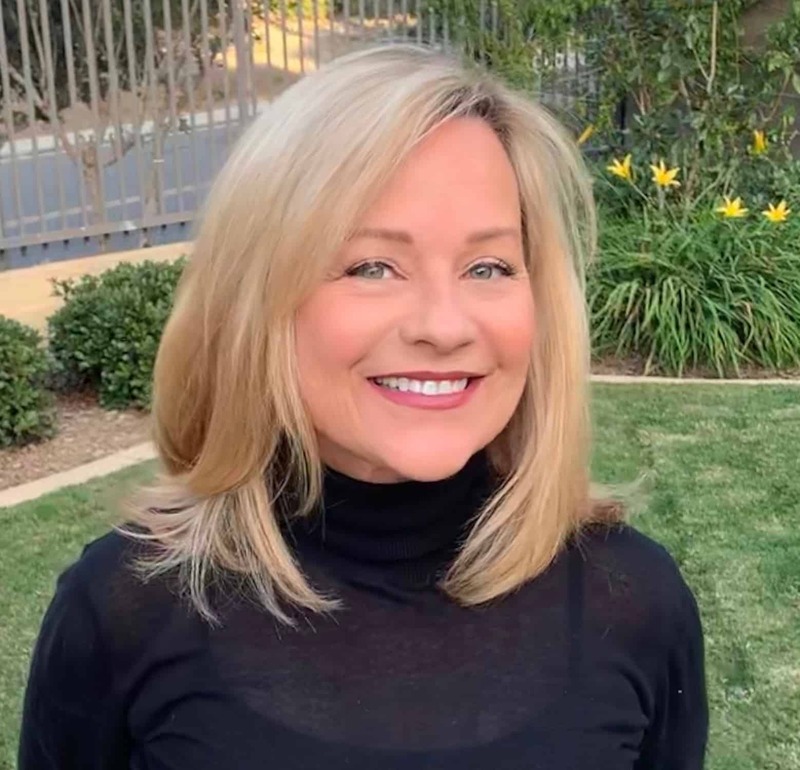 Just discovered your blog and wanted to say hello- I'm in OC as well and love Rogers! I think it's one of the happiest little places on Earth! The Social Climber is stunning. 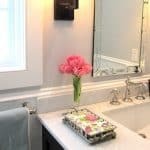 Great color paired with your newly plastered walls. ** G'morning, Sweetie!!! Oh how I WISH we could grow roses (and hydrangea!!!) here, but alas, the desert just does NOT seem to "like" them! YOURS IS BEAUTIFUL!!! As always, I lovvvvved visiting~~~ you never fail to delight, m'friend…EVERYTHING you share is always sonice!!! In keeping with the desert, all our garage doors are copper, and yes, I lovve it!!! If we WEREN'T here, I'd choose green grass, yummy flowers of all kinds and very cool garage doors like the ones you shared!!! Your Social Climber is beautiful and will be magnificent as it grows up to your balcony. I always enjoy your before and after photos. Because you have a basketball player in the family I think you were wise to skip the glass on the garage doors. 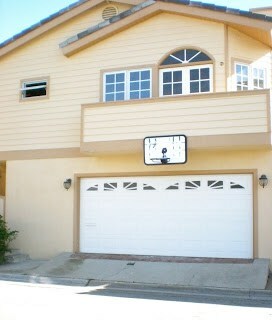 My neighbor did a make-believe carraige garage door with added hardware and no one believes it's make-believe. I think what you have is wonderful but if you really wanted the other look their are some "not so expensive" options. Fun post! Absolutely ADORE the tray and your kitchen is AMAZING!!! Yes…I love the roses! I was just reading an article in BH&G today about some pretty climbing ones. BUT…that bike is my fav! So love the color…..House is looking good. Love how you accessorized the dresser…..just a little fluffing goes a long way! Hi Mary Ann, thank you so much for your lovely comment! Just took a quick tour around your home! Stunning! Beautiful yet comfortable – with a hint of French – totally my style. Your whole home is beautiful but I really love your kitchen – divine! Your blog title really reflects your design ethic. You must be thrilled with the results of all your hard work – can't wait to finish my place – I've only started!! It looks so beautiful! Love the social climbers! The potted succulents are so gorgeous! I have that on my to do list for the kitchen. Have the container, just have to put it together. What a great idea to have a topiary in the center! I like what you did with your electronics. We have a television over the fireplace in the great room, and the wires are all internal behind the walls. However, there is an ugly receiver box that is sitting right on top of the mantel. It is so ugly, and I just don't know what to do with it. The tray is wonderful. I am hoping Target still has some I have the perfect place for one in my house. Oh and I LOVE your bike! Love everything…including the beach cruiser! 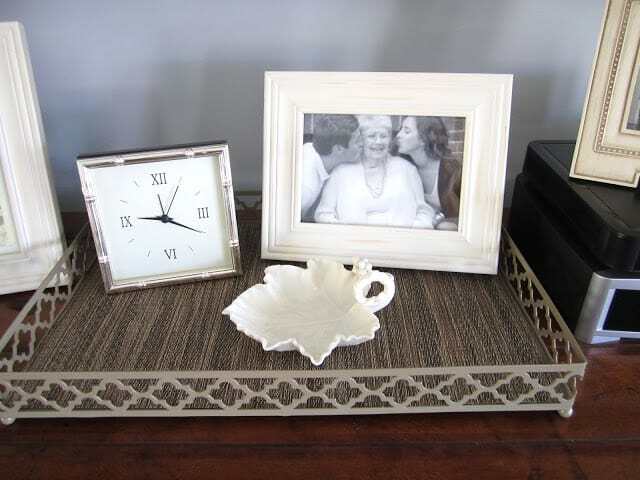 Love how you customized the tray with a placemat cut to fit…it's all the layers that really make everything perfect. 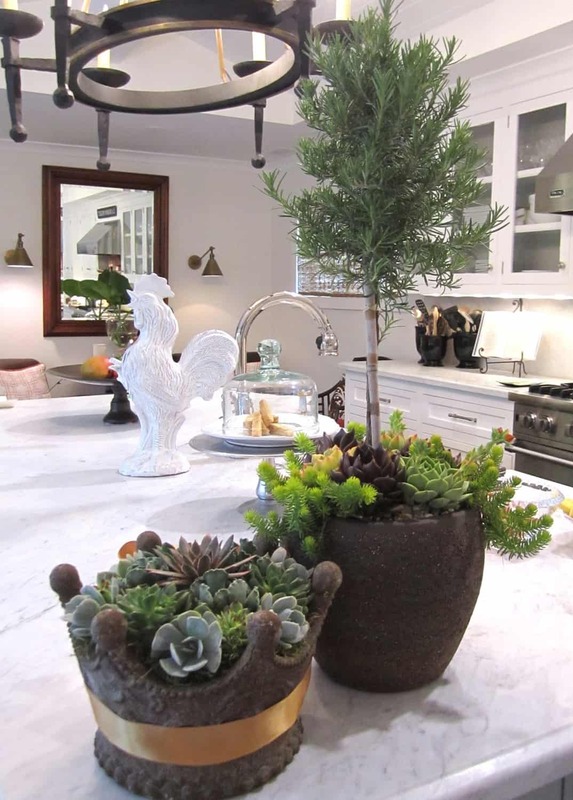 The succulents are gorgeous…like your entire house! I never get tired of seeing it. Please adopt me! I want to be your sister and get that Crown with Succulents for my B-day!!!! I love the transformation to the outside! The social climber is gorgeous! What a fun name! The flowers are so beautiful. And I love what you did with the dresser. It really hides the tv accessories well! Have a great weekend! You know I love those carriage doors! 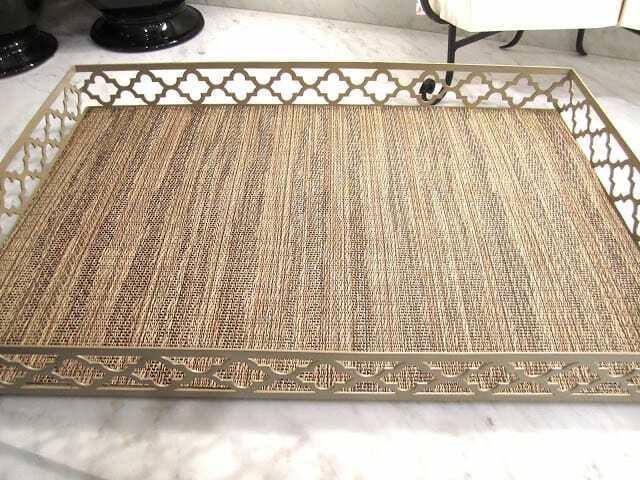 And that tray from Target is so cute! I haven't seen it. Might have to pick up one myself as it would match my rug! Thanks for sharing! I love your gorgeous roses and the way you camouflage the electronics. Oh, your bike is super cute by the way! Have a lovely weekend, Mary Anne! Don't forget to hop over and enter the Perricone MD $150 cosmetics giveaway!!! 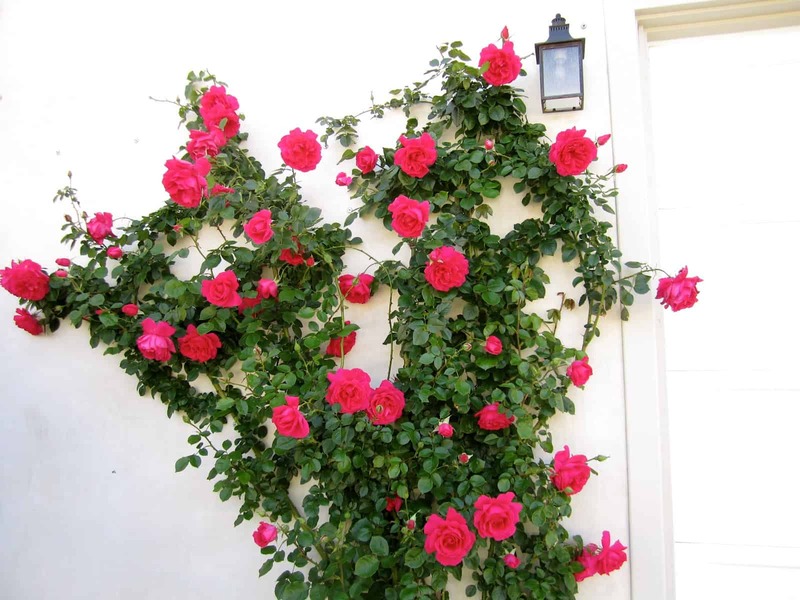 Your climbing rose is the perfect solution for filling up the bare wall. It already looks gorgeous, but imagine how good it will look fully grown. So cool! lovely! I too adore climbers, every cottage should have one & yes, those succulents are just amazing! I love what i see! You can't get better then climbing roses. Love your back of house redo – that social climber is gorgeous!! And isn't it amazing what a different a little accessory can make? I totally believe in the design power of trays!! That wall will be stunning covered with the climbing rose. Love the tray! The back of your cottage looks lovely indeed. I like the cleanliness of the colors. I love what you did on your garage door. It's very compelling. Those garage doors are really lovely especially when it's that clean. Thanks. Loved all you did…great inspiration ….Roses are my fav…thank you. Very nice indeed. 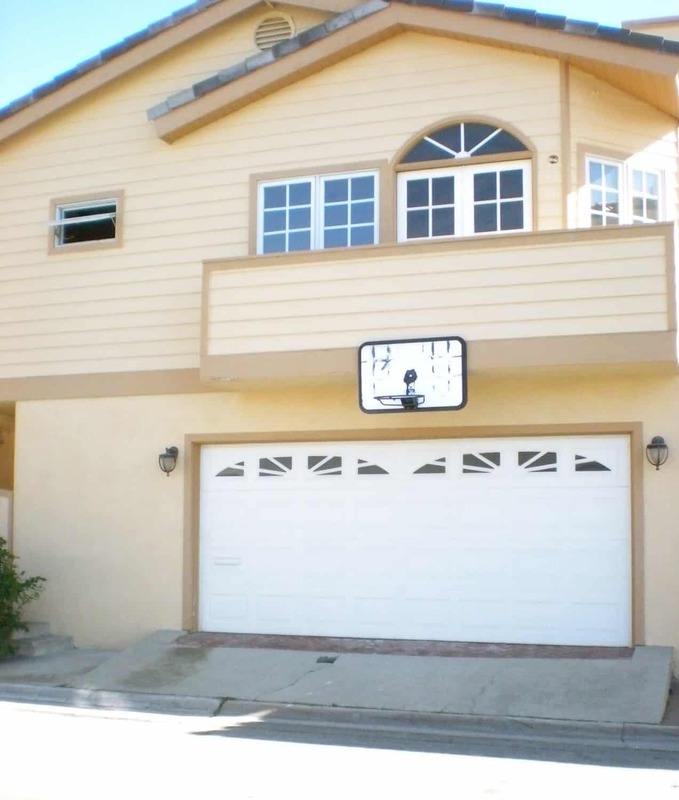 That garage door would be nice if they are remote-controlled. Our garage garage door remotes in perth took a while getting used to. I used to open the door manually and seeing my sister laughing would make me realize the door is remote-controlled!